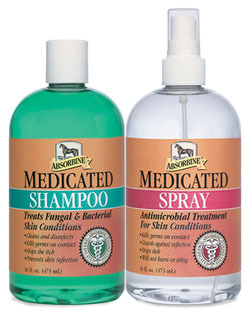 Absorbine® Medicated Shampoo and Spray is a safe, effective way to combat common skin conditions and prevent them from recurring. Used together or alone, the Absorbine Twin Pack is the first line of defence against rain rot, ringworm, girth itch, summer itch, grease heal, and other fungal and bacterial infections. Fortified with PCMX and Tea Tree Oil, it kills bacteria on contact, guards against infection, and soothes the skin and coat.